Left to Right: Robert S. Harward , Peter Eident, Christopher Davis, John McGowan, Lavern Heggem, Charles Laubach, Danya Trent, Elias B. Sayah, Daniel Feldman , Richard Lloyd, S. Qaiser Anis and John L. Habib. Abu Dhabi, UAE – United Technical Services (UTS) was honored with ‘The Pearl Award’ at AmCham Abu Dhabi’s 6th Excellence Awards on Friday, 29 January 2016. The ceremony took place at Jumeirah at Etihad Towers Abu Dhabi with The Guest of Honor, H.E. Sheikh Nahayan Mabarak Al Nahayan, Minister of Culture, Youth and Community Development, UAE. 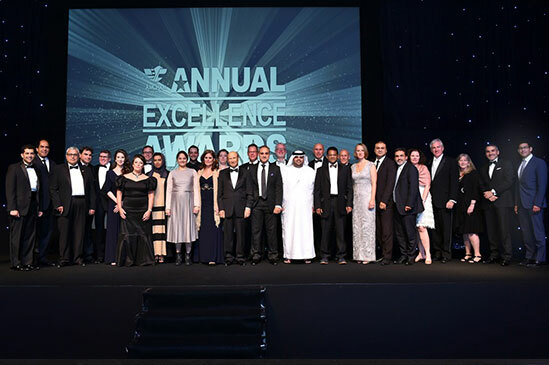 The event comprised of the AmCham AbuDhabi’s 6th Excellence Awards, 16th Charity Gala and 30th Anniversary Celebration, Top business executives and government officials came together to recognize leading UAE, US companies, institutions and entrepreneurs for their dedication towards strengthening UAE – US commercial relations. Mr. Richard Lloyd, Sr. VP – Energy Services was at the function representing UTS. The Excellence Awards applaud Emirati and American individuals and businesses for their achievements in the local business community. 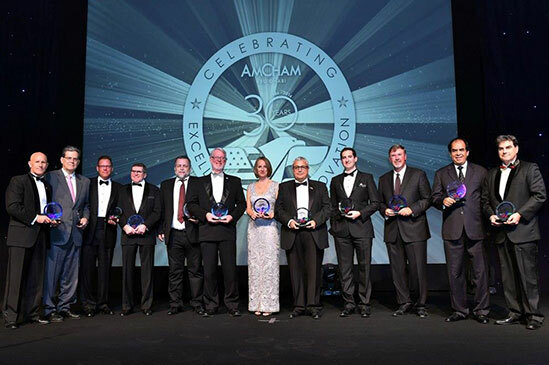 In honor of the 30th Anniversary of AmCham Abu Dhabi, the 2016 Awards included a special award category named ‘the Pearl Awards.’ The Pearl Awards recognize AmCham Abu Dhabi’s founding Individual and Corporate Members, Constitution Writers, former Presidents and Chairpersons and their contribution to enhancing UAE - US. commerce, trade and investment. The event was attended by the Founding Individual Members: John McGowan; Founding Corporate Members: Afridi & Angell, CRSS International, Lockheed Martin Corporation, Raytheon International Inc., Sayah Engineering Consulting Bureau, Shearman & Sterling LLP and United Technical Services; Constitution Writers: S. Qaiser Anis, Lavern Heggem, Charles Laubach and Elias B. Sayah; Former Presidents: Charles Laubach, Peter Eident and John L. Habib. The 6th AmCham Abu Dhabi Excellence Awards Winners, Nominees, Sponsors, VIPs and AmCham Abu Dhabi Falcon Members and Board Members.